Passive yet charming, this baby possesses endearing qualities that makes him/her an immediate favourite with everyone. 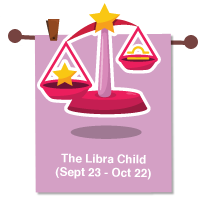 Even-tempered and sweet in disposition, the Libra Baby loves to have others around and would much rather be with company than alone. Even-tempered Libra children love maintaining harmony in their relationships and environments. As born mediators, they are sweet and naturally polite, but their urge to please everyone can lead to difficulties. They have a hard time making a decision that may offend someone or cause hurt feelings. As a parent, show them that occasional disagreements are an unavoidable part of life and take care to always build their self-confidence.